On the Northern edge of campus, unobstructed to East and West, is a grand, domed building made of stone. The architecture is ancient Roman in design and rests on a slight hill, as if overlooking the rest of campus. The main entrance is to the South, through tall, wide doors set at the top of a staircase designed to look like marble. The outside of the building is plain, the walls curved instead of having corners, with large, multi-paned windows to let in the light. Through the main entrance, the foyer is marble, opening onto a wide courtyard filled with the sounds of laughter and water. Marble columns separate the foyer from the inset floor beyond, another, shorter set of stairs leading down into the main room of the Water Dorm. 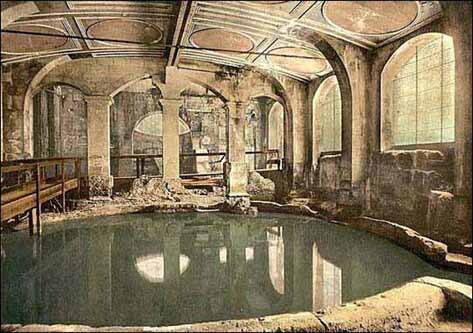 Marble columns surround the circular pool, the water crystal-clear, the colored tiles on the bottom easily seen when not obstructed by people. The transparent dome illuminates the pool even on the darkest of nights, the wide windows to the East and West allowing sunlight in from sunrise to sunset, and the steamy air caresses the skin like a lover. Sometimes, when all is quiet, whispers and giggling can be heard in the mists. The pool is the gathering place for the Water Dorm. The main room is rectangular in shape, with steps circling down to the pool at the bottom so that students may sit at their ease upon the steps when they do not wish to lounge within or play amongst the pools. This room can easily hold 300 or more people and echoes with the gasps of wonder from first-time visitors. To the North are the communal baths, with staircases up and down to each section of the dorms. To the left and right of the main doors are the dorms. The corridors are wide, the walls those of ever-flowing waterfalls, tinkling merrily no matter the hour. To the West is Frey Wing; to the East is Pertho. The living rooms of the underclassmen overlook the school grounds, and all the doors open off the wide corridor overlooking the pool. There are winding water slides in the corners to allow easy access below. The upperclassmen descend to a level beneath the pool, where the water drips down, the walls a living sea. Made of glass, the lower levels resemble a vast aquarium, both salt and freshwater tanks dividing the rooms and common areas. The center is smaller, low couches and cushions together in an intimate setting, sharks and other fish swimming above their heads in ever-connected, watery structures. If one could see beyond, they'd look up into the bottom of the pool above. The lower levels are cooler and quieter, sounds muffled, and with many hidden nooks and secret crannies to lose oneself, the walls curved and twisting, the doors resembling waving strands of seaweed or luscious coral, or some other structure of the deep. There is peace here. Welcome to the Water Dorm. In the water dorm, the upperclassmen are mostly downstairs and the underclassmen upstairs where they can be noisy and rowdy without bothering the others. However, those who cannot stand the noise and commotion or are otherwise upset by being so close to the openness and light are welcome downstairs and those who cannot stand living beneath the ocean are welcome upstairs. Room and roommate swaps must be approved by the members of the swapping rooms/roommates and Professor Dacon. The water dorm is large and there are some rooms with single occupants, but that again must be approved. The hallways upstairs are straight and obvious; downstairs, the paths twist and curve and wind back on themselves. The bathrooms are to the North end of the complex, so the rooms closest to there on both resident floors see the most traffic, as do the ones closest to the stairs on the South (entrance side). To the West is Frey Wing; to the East is Pertho. Roster/Resident List can be found here.